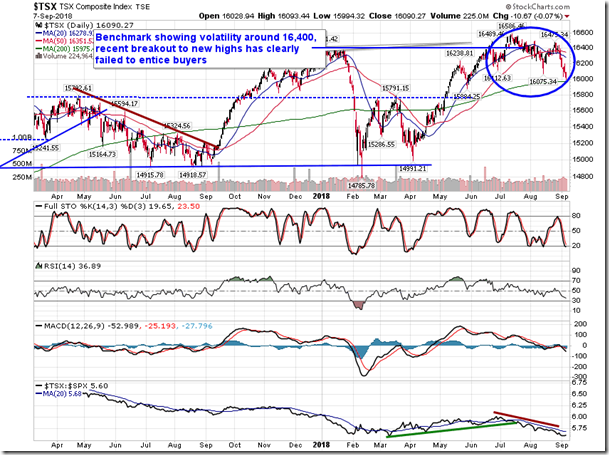 Strong employment report in the US fails to mitigate general equity market weakness. Stocks ended lower on Friday, capping off a week in which the S&P 500 Index closed in the red each day to start the month of September. 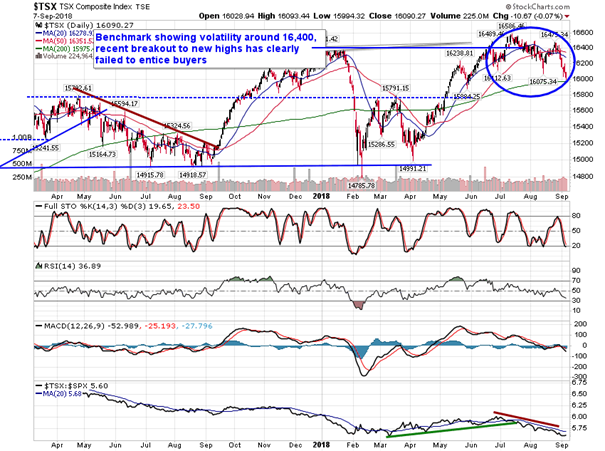 The benchmark was lower by two-tenths of one percent, continuing to push against its rising 20-day moving average. Trade remains in focus as investors reacted to headlines that the Trump administration may be considering additional tariffs on Chinese goods. The news overshadowed what was generally an upbeat read of employment activity in the US. 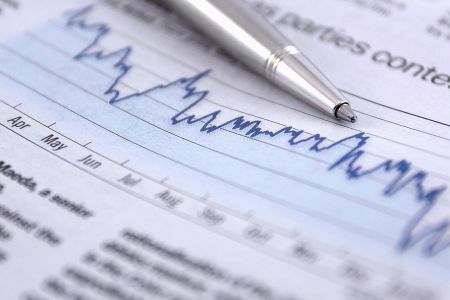 Before the opening bell, the Bureau of Labour Statistics reported that nonfarm payrolls increased by 201,000, surpassing the 195,000 forecasted by analysts. The unemployment rate remained unchanged at 3.9% and average hourly earnings ticked higher to 2.9% from 2.7% previous. Stripping out the seasonal adjustments, nonfarm payrolls actually increased by 334,000, or 0.2%, inline with the average change for this summer month. The year-to-date change now sits higher by 0.5% through the end of August, around three-tenths of one percent above the seasonal average trend. The year-to-date change in manufacturing employment continues to stand out, up by 2.0%, or 1.9% above the seasonal average change through this point in the year. Manufacturing employment has shown no negative gyrations attributed to the summer shut-down period in July, a testament to the strength in manufacturing activity in the US. Shedding further light on manufacturing employment, a broad set of categories are showing above average strength, including wood products, metals, machinery, computers, electronics, transportation equipment, food, apparel, and petroleum. The only manufacturing category to show a below average trend through the end of August is communication equipment, the result of one of the largest August declines in this category on record. Elsewhere, transportation employment, whether looking at air, rail, or trucking, are showing gains that are well above average as the industry deals with a capacity problem. 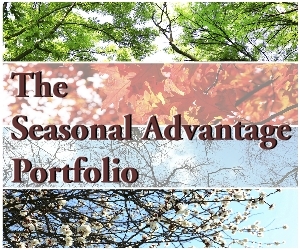 Seasonally, hiring in these categories typically declines in the last four months of the year, but, with demand outweighing supply, the seasonal weakness that is typical through the remaining months of the year may be muted. Highlighting one area of weakness, utilities payrolls is showing the weakest change since the year 2000. Utilities payrolls are lower by 0.4% through the end of August, which is 2.1% below the seasonal average change. Various efficiencies are limiting the need for hires in the utility sector. Utilities employment has historically been the strongest through the summer months, the result of strong demand for electricity and water. Overall, aside from weakness in utilities, the report is indicative of a strong economy as businesses flourish in this new tax era. Seasonally, hiring activity ramps up in September and October as holiday hires are brought on ahead of the prime end of year spending period. 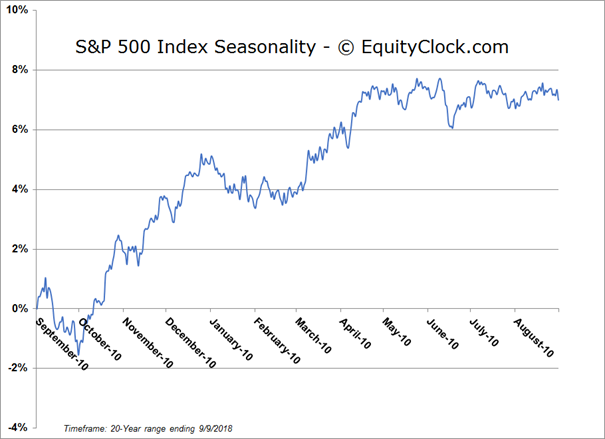 For a complete breakdown of the results in seasonal chart format, the data is available at https://charts.equityclock.com/u-s-employment-situation. As for wages, the 2.9% year-over-year headline print did stir reaction in the bond market as investors price in the risks of a more aggressive fed as it seeks to normalize policy. However, the non-adjusted change wasn’t nearly as hot. Average Hourly Earnings of Production and Nonsupervisory Employees actually declined by 0.3% in August and is now showing a gain of 1.5% year-to-date. This is approximately seven-tenths of one percent below average, a factor of the sluggish pace of inflation from the past few years. The pace this year is around three-tenths of a percent above last year’s rate, which saw a gain of 2.5% as of the end of the year. Wages currently do not seem to have the steam to muster a 3% annualized print, but investors appear to be weary that one may be achieved to warrant a more aggressive stance by the fed. Seasonally, September is the strongest month of the year for wage gains as lower paid summer hires come off and full-time hires are put to work. North of the border, Statscan also released labour force statistics for the month of August. The headline print indicated that employment in Canada fell by 51,600, a significant divergence compared to expectations of an increase of 15,000. The result pushed the unemployment rate higher by a tenth of a percent to 6.0%. 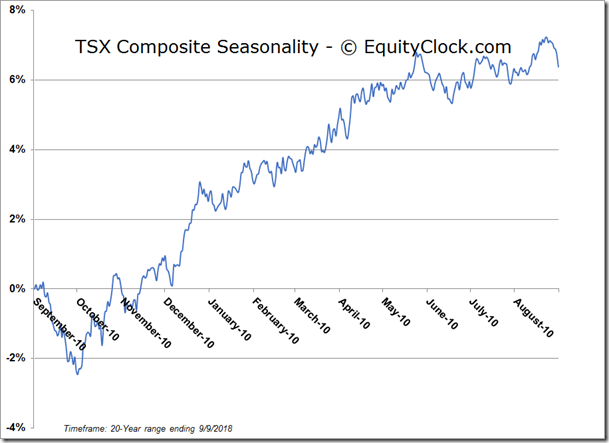 Stripping out the seasonal adjustments, employment in Canada actually fell by 94,800, or 0.5%, much weaker than the 0.1% decline that is average for the summer month. The result puts the year-to-date change in employment higher by 1.5%, which is half of the 3.4% increase that is average through this point in the year. Full-time employment is running 1.9% below average, while part-time employment is running 1.7% below the seasonal norm. The change in unemployment recorded a sizeable jump in the month, now running 11.5% above the seasonal average trend, placing it on track for the largest increase since 2009. Parsing the categories, the trends are almost opposite to that seen in the US. Below average manufacturing employment and above average utilities employment stand out amongst the charts. Weakness is also being felt in agriculture, construction, wholesale/retail trade, health care, and finance, representing a broad cross section of the economy. Transportation and business building are the few areas of strength. August is typically the peak for the year for employment in Canada, following which declines are typical through the last four months of the year. 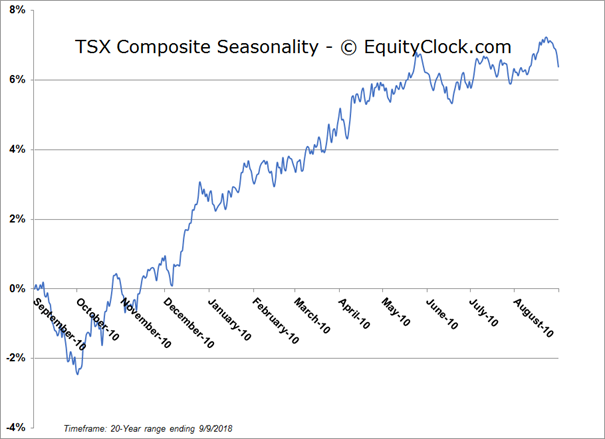 For further insight on the areas of strength and weakness in Canadian employment, the seasonal charts are available in the chart database at https://charts.equityclock.com/canada-labour-force-survey. The employment data did little to mitigate the weakness that was realized in broader equity benchmarks for the week. 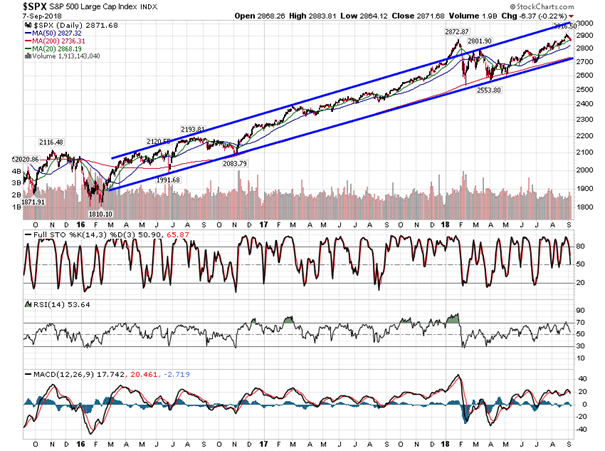 The S&P 500 Index was down by 1.03%, showing only the second weekly decline since the start of July. 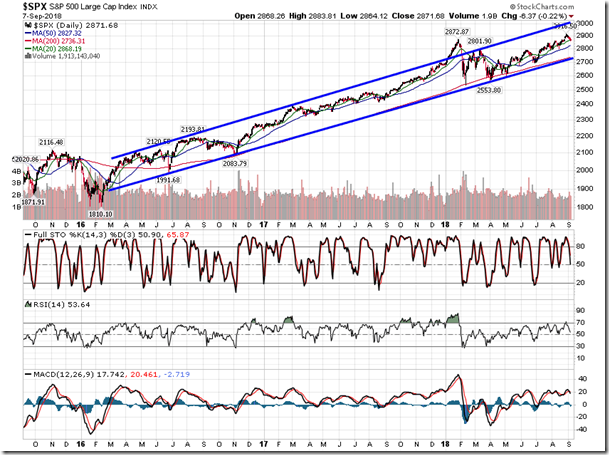 Variable support at the 20-week moving average now hovers around 2780. 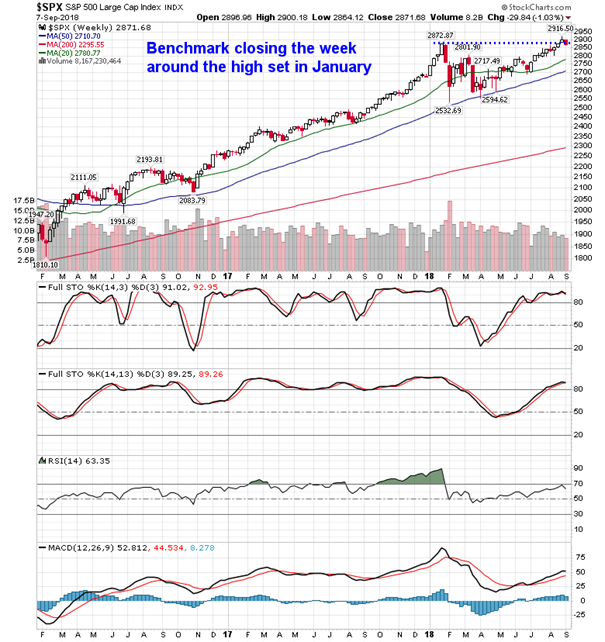 Momentum indicators on this weekly look are showing slight signs of rolling over, potentially poised to trigger sell signals in the coming weeks. 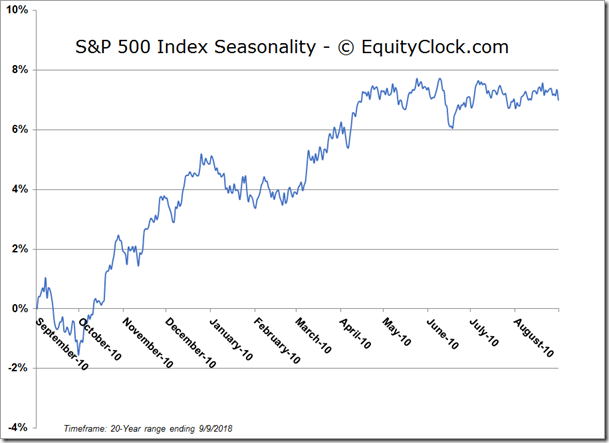 Of course, September is the weakest month of the year for stocks and the week just past saw investors booking profits in some of this summer’s market leaders, primarily in the technology sector. Energy was also a drag as oil prices came off, but this resulted in a benefit to the transportation sector. 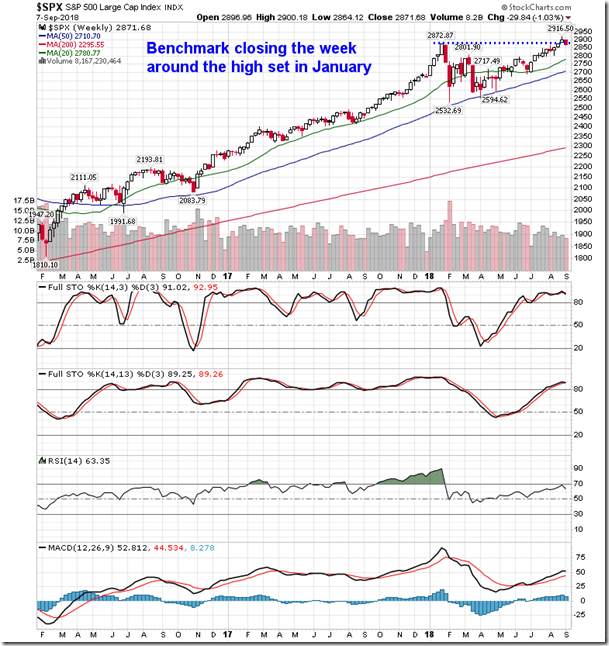 The Dow Jones Transportation Average was higher on the week by four-tenths of one percent, holding close to its all-time high charted in January. 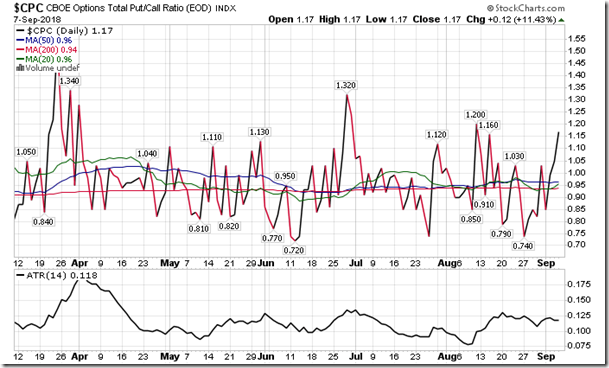 Still, this risk-on perception provided by the transportation benchmark was overshadowed by a jump in the risk-off plays as the consumer staples and utilities sectors gained over one percent. Cyclical sectors were generally lower on the week. With stocks around all-time highs and uncertainty surrounding trade and other issues still heavy on investor sentiment, a positive catalyst may be required to fuel another push higher in the broader market, otherwise gravity may take control. 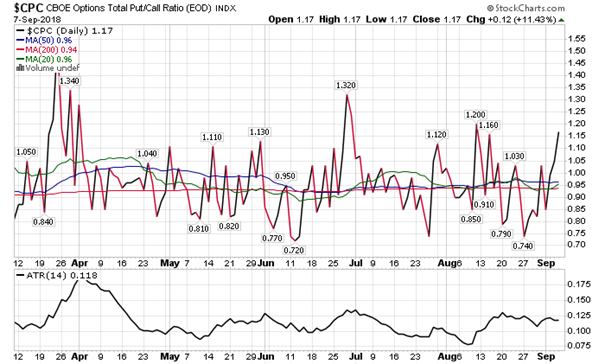 Sentiment on Friday, as gauged by the put-call ratio, ended bearish at 1.17.